Three generations of the Mac Pro. Upgrading the RAM in the 2009, 2010, or 2012 Mac Pro is one of the easiest DIY projects you can perform on a Mac. It may also be the most beneficial. With memory prices low, and RAM upgrades easy to perform, this may seem like a project that everyone should tackle. But before you jump into upgrading your Mac’s memory, it’s important to consider whether you actually need additional RAM. No matter how inexpensive RAM is, buying memory you don’t need is a waste of time and resources. Luckily, your Mac includes a handy utility you can use to monitor memory performance as well as determine whether you need additional RAM. You can use Activity Monitor to discover how you are currently using the RAM installed in your Mac and to see if additional memory would be helpful. Keep an eye on the Memory Pressure Chart which indicates if you have free RAM available, or if your Mac is compressing the memory to better utilize the available RAM. Activity Monitor's Memory Pressure graph can help you decide if you wold benefit from additional RAM. Screen shot courtesy of Coyote Moon, Inc. The 2009 Mac Pro was the first to dispense with the FB-DIMMS (Fully Buffered Dual In-Line Memory Modules) and their huge heat sinks, which were used in the first few years of Intel-based Mac Pros. PC3-8500 is the module name, shorthand for describing the peak transfer rate that can be obtained from the memory module; in this case, 8,500 MB/s. 1066 MHz is the clock speed. DDR3 stands for double data rate type three, a high-speed RAM interface. EEC is error-correcting RAM, which is able to detect and correct errors when the processor reads the RAM’s data. SDRAM is synchronous dynamic random access memory. In essence, the RAM and the processor memory bus are synchronized to the same clocking system. UDIMMS means the memory is unbuffered, unlike the FB-DIMMS we mentioned earlier. The 2010 and 2012 Mac Pros use two different speed ratings of RAM, depending on which processor type is installed. Quad-core and 8-core models use PC3-8500, 1066 MHz, DDR3 ECC SDRAM UDIMMS, the same RAM used in the 2009 Mac Pro. Six-core and 12-core models use PC3-10600, 1333 MHz, DDR3 ECC SDRAM UDIMMS. This RAM has a faster clock speed to match the faster memory controller in the 6-core and 12-core processors. It’s possible to use the slower PC3-8500 memory in 6-core and 12-core Mac Pros. The processor’s memory controllers can slow down the clock rate to match the slower RAM, but you’ll receive the best performance if you correctly match the faster processors with the faster RAM. You may ask why you would even consider using slower RAM. If you’ve upgraded one or more processors from a quad-core to a 6-core, then you currently have the slower RAM installed. You may continue to use the slower RAM, although I recommend upgrading to faster RAM as soon as possible to get the most out of your processor upgrade. 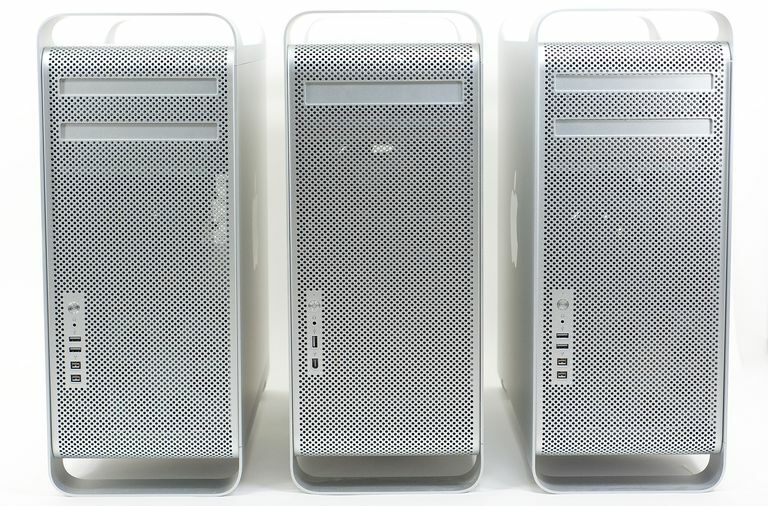 When it comes to RAM, the 2009, 2010, and 2012 Mac Pros are very similar. The memory slot layout and how the slots connect to the processor’s memory channels are the same. The main difference when installing RAM is the processor. The single-processor models have a processor tray with a single large heat sink and one set of 4 memory slots (fig. 2). Dual-processor models have a processor tray with two large heatsinks and 8 memory slots (fig. 3). The 8 memory slots are grouped in sets of four; each group is next to its processor. Not all memory slots are created equal. The processors in the Mac Pro each contain three memory channels, which are wired to their memory slots in the following configuration. Slots 3 and 4, as well as slots 7 and 8, share a memory channel. The best memory performance is achieved when slot 4 (single-processor model) or slots 4 and 8 (dual-processor model) aren’t occupied. By not populating the second of the paired memory slots, you allow each memory module to connect to its own dedicated memory channel. If you do choose to populate the last memory slots, you may reduce optimum memory performance, but only when the memory in the shared slots is being accessed. Officially, Apple says the 2009, 2010, and 2012 Mac Pros support 16 GB of RAM in the quad-core models and 32 GB of RAM in the 8-core versions. But this official support is based on the size of the RAM modules that were available when the 2009 Mac Pro first went on sale. With currently available module sizes, you can actually install up to 48 GB of RAM in the quad-core model and up to 96 GB of RAM in the 8-core version. Memory modules for the Mac Pro are available in 2 GB, 4 GB, 8GB, and 16 GB sizes. If you choose the 16 GB modules, you can only populate the first three memory slots. Additionally, you cannot mix modules of different sizes; if you choose to use 16 GB modules, they must all be 16 GB. Two memory modules: Slots 1 and 2. Three memory modules: Slots 1, 2, and 3. Four memory modules: Slots 1, 2, 3, and 4. Four memory modules: Slots 1, 2, 5, and 6. Six memory modules: Slots 1, 2, 3, 5, 6, and 7. Eight memory modules: Slots 1, 2, 3, 4, 5, 6, 7, and 8. Notice that in the above configurations, slots 4 and 8 are the last to be populated, ensuring the best overall memory performance. Apple 2009 Mac Pro Manual, including memory upgrade guide. Apple 2010 Mac Pro Manual, including memory upgrade guide. Apple 2012 Mac Pro Manual, including memory upgrade guide. Memory for Mac Pros is available from many third-party sources. The ones we link to here are all reliable and represent just a few of the available choices. These are listed in alphabetical order, not preferential.